The Midnight Review: Does Rick Scott's Shadow Fundraising Violate Election Law? Does Rick Scott's Shadow Fundraising Violate Election Law? Today, I had received numerous political advertisements in the mail but one in particular caught my eye - an advertisement for Republican gubernatorial candidate Rick Scott for an organization called "Let's Get to Work." Out of curiosity, I had decided to look further into the group that had sent out this mailing and found something very interesting - Let's Get to Work was founded by Rick Scott and the only associated candidate with the organization is Rick Scott. The organizations website is nothing but a Wordpress blog that lists the millions in organization expenditures as well as contributions (a majority from his wife). Scott established the organization to avoid letting his primary opponent - Bill McCollum - receive matching funds. The organization, a 527, is not subject to contribution or spending limits, giving Scott a shadow campaign that he can operate outside of federal election regulation - just recently Scott's group raked in over $300,000 in donations - mostly from health and business groups. A 527 organization or 527 group is a type of American tax-exempt organization named after a section of the United States tax code, 26 U.S.C. § 527. A 527 group is created primarily to influence the nomination, election, appointment or defeat of candidates for public office. Although candidate committees and political action committees are also created under Section 527, the term is generally used to refer to political organizations that are not regulated by the Federal Election Commission or by a state elections commission, and are not subject to the same contribution limits as PACs. However, on September 18, 2009 the Washington D.C Federal Appeals Court ruled that these groups have a First Amendment right to raise and spend freely to influence elections so long as they do not coordinate their activities with a candidate or a party. What makes Scott's group stand out is that Scott founded the organization and he is the only one that benefits from the organization. 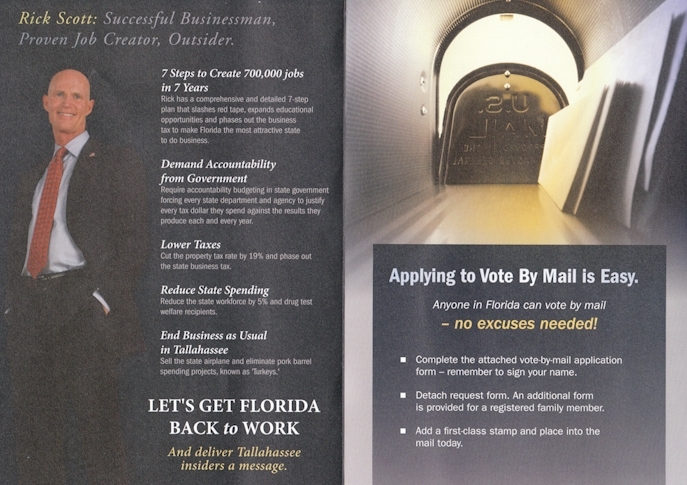 Ontop of that, Let's Get to Work is guilty of attacking other candidates - not the issues - and if you look at the mailing I received, it clearly pushes for Scott's campaign - the entire mailing is about Scott, calling for the recipient to "deliver Tallahassee insiders a message" - send Scott to the capitol. This is just another reason why not to vote for Rick Scott.